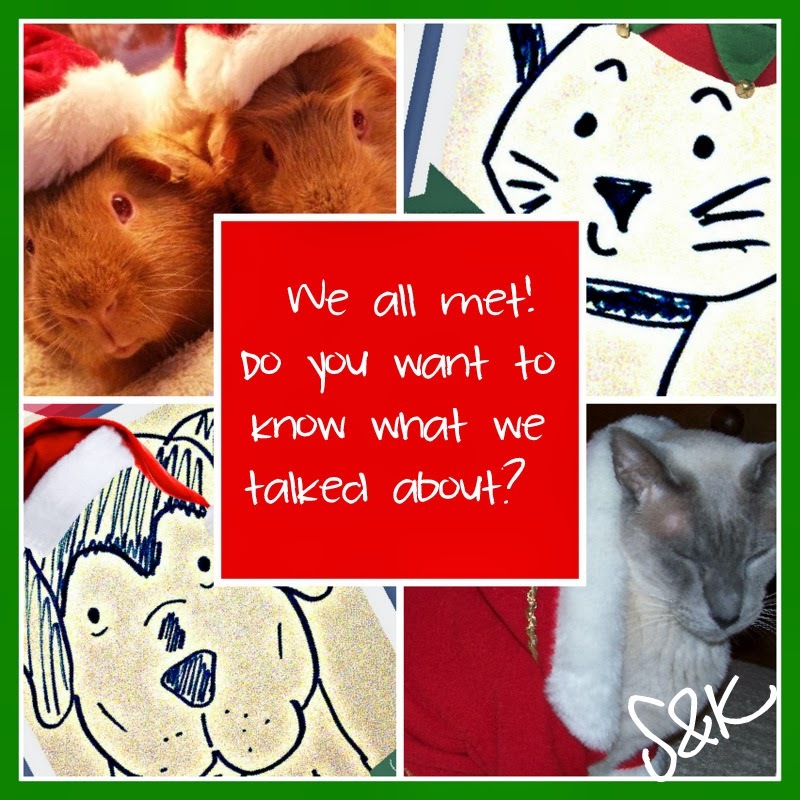 This is Part II of our PetBookCharCon post. Yippee! Stanley and I recently attended PetBookCharCon*. It is a huge convention just for animal characters of books. It was impressive and fun. In one of our breakout sessions we were lucky enough to be grouped with Fred & George, (guinea pigs from The Princelings of the East Series), and Max (a cat from The Shadows of the Past Series). The leader of the breakout session gave us a handful of questions to answer to help us get to know each other better. We are thrilled that we have everyone’s permission to share this epic moment in PetBookCharCon history. Please note: due to the wordiness of the characters involved, this interview was broken into two parts, with the first portion posted on December 5th. Be sure to scroll down to the bottom to enter the giveaway! Katrina: When Stanley and I tango danced. Stanley: When Katrina and I tango danced. Max: I’ve had more than a few embarrassing incidents, for example I didn’t like it when I had to be disguised as a baby during our trip to Atlantis – that was really undignified. But I think my most embarrassing moment happened when I first met the famous Boy-King Tutankhamun at his palace in ancient Egypt. I ran off screaming when I saw him, because I thought he was a mummy. It wasn’t my fault though. His legs were wrapped in bandages, following an unfortunate encounter with a crocodile and, from where I was standing, that was all I could see. Easy mistake to make! Jemima was pretty cross with me for behaving like that in front of a Pharaoh. Katrina: A baby! That IS undignified. Fred: For me, it was when I was very small and I tried to do something no-one had done for years, and stupidly I told everyone I was going to do it. A huge crowd turned out to watch and I made a complete fool of myself. George said I shouldn’t worry as at least I’d tried, but I still felt a fool for building myself up as something special, which I wasn’t. The challenge was to run around the inner courtyard of the castle, but without touching the ground at any point, only using the battlements, window ledges, crevices, flagpoles and anything else to leap from point to point. I fell off on the third corner straight into a crowd of people including my Uncle Vlad. George: I think there used to be another flagpole there which is why no-one’s done it for centuries. 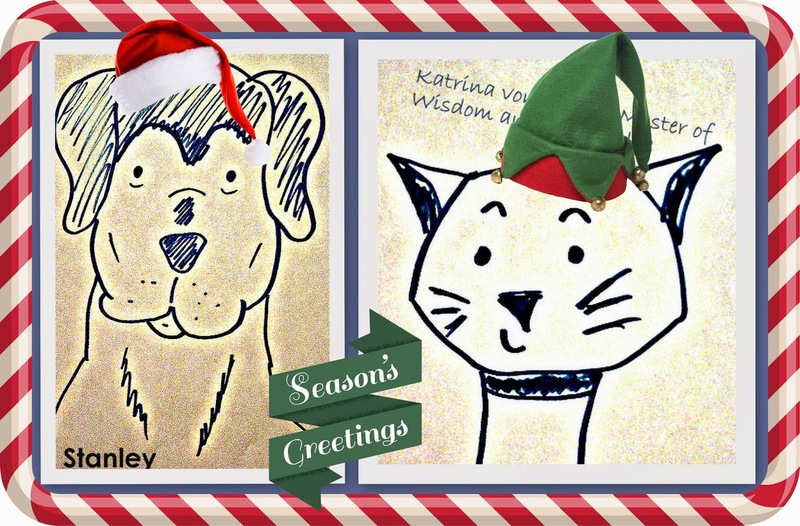 We’re putting another one up in time for Yule this year and reinstating the challenge. It’s called ‘wall-running’ and lots of castles do it. Fred: What’s your embarrassing moment, George? George: Well, I get embarrassed quite easily, especially by people making me out to be more than I am. But I was very embarrassed when I didn’t realise for a while that Kira had been kidnapped when we were with her. I should have spotted that sooner. Have you ever made a speech and if so, what was it about and how did it go? Max: I’ve never had to make a speech in public as I’m not supposed to talk in front of grown-ups. On the few occasions when I have broken the rule and spoken to a stranger, they’ve reacted very strangely and freaked out. Some people just find it too hard to accept that a cat can talk. Fred: I have to make speeches all the time at Yuletide. George: You have at least three days when you don’t. Fred: Not if Kira gets her way with the Arts Festival. Fred: The worst one is the Solstice speech. It’s supposed to be about the dark time of year, and the sun going to renew itself, just as our land will renew itself and all that, but of course now we know the earth goes round the sun and its just the eccentricity of the orbit and the tilt of the earth’s axis that makes the sun sink so low and the days get short. George: He built a lovely machine called an orrery and put it so that everyone could see all the planets whirling round. Fred: Well, you built it for me, I just ordered it from that lovely Dr Zelli in the Rhinelands. George: It’s a really nice machine. Fred: Tell them about your speeches. George: Oh, I don’t do speeches. I sometimes have to tell people about my work, but that’s different. Fred: He’s very good at telling people about his work. Short and clear, then sits down again. George: Well, that’s all that’s needed, isn’t it? Stanley: I have never made a speech in my life. Katrina: So, it went well! George: I like playing Pin the Tail on the Carriage Horse. You have a picture of a horse on a wall, and someone blindfolds you and gives you a bit of wool, representing the tail of the horse, and you go to the wall and pin it on. It’s very funny when you find you’ve pinned it on his nose, or ears, or nowhere near him! Katrina: Oooo my favorite party game is Eat Treats. Stanley: My favorite party game is Chase the Cat Eating Treats. Fred: Have you heard of ‘Charades’? I enjoy that game. George: You have to act out the name of a book or play. The others have to guess what it is. Fred: I’m good at guessing that. George: It’s because you’ve read more books than anyone else. Fred: You’ve read a lot of books too. George: Yes, but no one is going to suggest “Particle theory and the strange lights of the North” as a party title. Fred: Hmmm. You’ve just given me an idea! Max: I’m not really into party games as they tend to be rather noisy. Jemima made me play Twister once and I ended up tied in all sorts of knots - it was most uncomfortable. But the twins used to have a board game which I found quite interesting. It was called Mousetrap, but I was always getting into trouble for running off with the little plastic mice. Read the first half of this post now. "Five book characters (all #pets) meet and share their secrets." Click to tweet. You can find more interviews with the five animal characters at Jemima Pett's blog and at Wendy Leighton-Porter’s website. 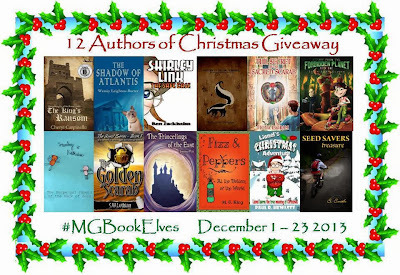 The authors listed below will be interviewing each other, reviewing each others' books, and more in the Giveaway blog tour starting today, December 1, 2013! Click the links to visit their paw-riffic websites and find out more about them, and check out their books in the InLinkz list below.